Greek food is well known the world over and many visitors to Greece arrive already equipped with some knowledge of common dishes like mezes, souvlaki, moussaka, Greek salad, etc. Some of the names may not be familiar, but we most probably have had some tyropitakia (small cheese pies), soutzoukakia (meatballs in red sauce) or britzoles arnisies (grilled lamb). Seafood is plentiful here as Greece is surrounded by sea and fishing is part of the mainstream agriculture. Fish like sea bream (Tsipoura), mackerels (kolioi), whitebait (marida or maridaki) and swordfish (xifias) are easily available, as are calamari and octopus (htapodi) – if you know how to ask for your preferred fish. I must say that the Greeks cook calamari very well – the batter is really light and not greasy. Whitebait is a favourite with Greeks as it goes well with Retsina wine. 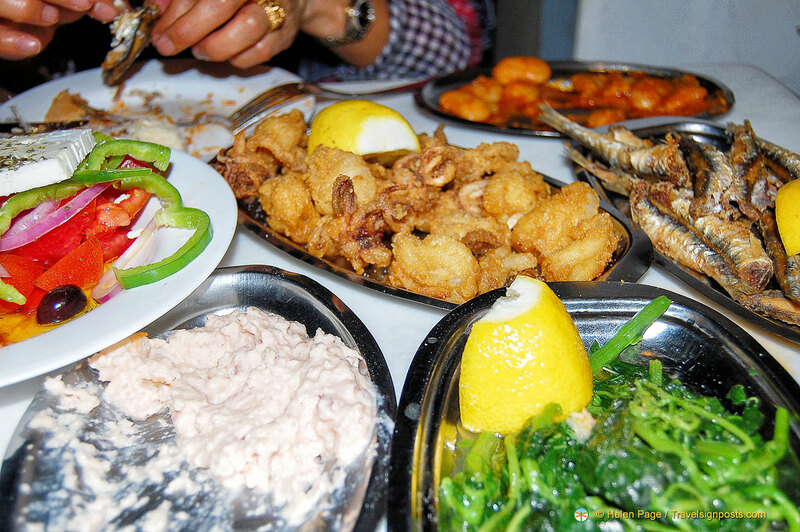 Greek cuisine is not complicated and very much based on fresh meat, vegetables, seasoning and cooked in olive oil. Tavernas are the traditional Greek dining establishments where food is prepared fresh each morning and served throughout the day. If you tire of Greek food and want a choice of international cuisines, then you may need to go to a restaurant (estiatória) which incidentally is more expensive than tavernas. Alternatively, there are popular ethnic restaurants like Chinese, Italian, Mexican as well as sushi bars. Typical of Mediterranean cultures, the Greeks have their lunch quite late and dinner can be anything from 9pm onwards. Meals are eaten at a leisurely pace so dinner can end quite late by some Western standards. They generally don’t eat breakfast and it’s common to grab a mid-morning snack (kolatsio) like a cheese or spinach pie from a nearby bakery. Weekends might be different. I recall walking through the Plaka one Sunday morning and the locals were already digging into their grilled meats at the market stalls. Their ability to eat meaty food in the middle of the morning made an impression on me. There’s no shortage of food places in Athens, especially around the Plaka area. The universal rule of thumb when selecting a taverna is to check out the diners – if the majority are Greeks, then you’re on the right path to good food. Places that advertise Moussakas for 5 Euros in 15 languages are not likely to serve you quality, authentic food. To dine the way that Greeks do, you’ll start with mezes or mezedakia. These are small dishes with various delicacies. For mains, order whatever you’re craving or ask the waiter to suggest whatever’s good. In summer, it’s great to dine outdoors, under the stars. Our favourite dinner places are around the fringe of the Acropolis. The view of the Acropolis is breathtaking at night as the floodlights beaming from the Acropolis give a divine aura to the place. Yes, the gods are with us! A “service charge” is included on your bill in Greece and this represents the tip. The amount is set and controlled by the government. If you feel that the food or service is particularly good, then it is common to leave an additional small amount. In the touristy areas waiters have come to expect additional tips.